Introduction: Here on our first slide, we have John reluctantly ratifying the Magna Carta. He is surrounded by his barons and senior clergymen, and they are all gathered at Runnymede meadow, neutral ground between Windsor Castle and the lands of his barons. But on this image, which dates from centuries after the Magna Carta there is a small historical inaccuracy…King John is holding a quill signing the Magna Carta in this image, when in fact he engrossed the Magna Carta with his seal…Little thing like that may not seem particularly important, but its indicative of how the Magna Carta passed into mythology. All sorts of myths and legends grew up around King John and the Magna Carta – this is a part of history that passed into popular culture. 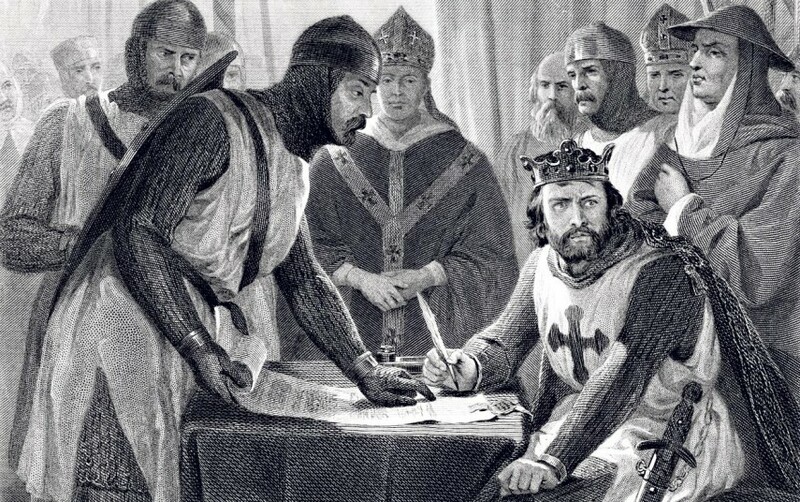 So the way we see King John and the Magna Carta today was not necessarily the way John and his barons saw the document in 1215, nearly 800 years ago.